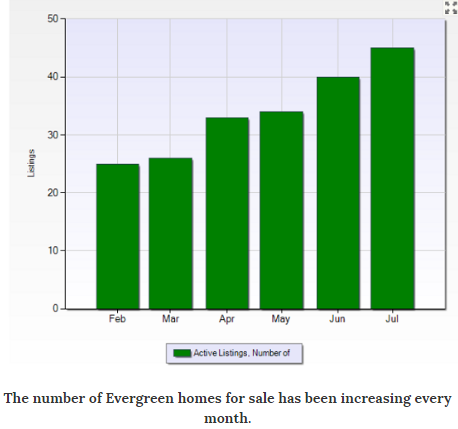 I have been selling in the Evergreen real estate market for many years now. And, I can tell you that you need to know how much leverage you have with listed prices on homes for sale. Sometimes very low offers can work while sometimes they cannot. So, it is important for every potential buyer and seller in the Evergreen real estate market to do some research and see what the current statistics suggest is the current reality of prices, number of listings, and number of sales. I know that everyone goes glassy-eyed reading statistics. 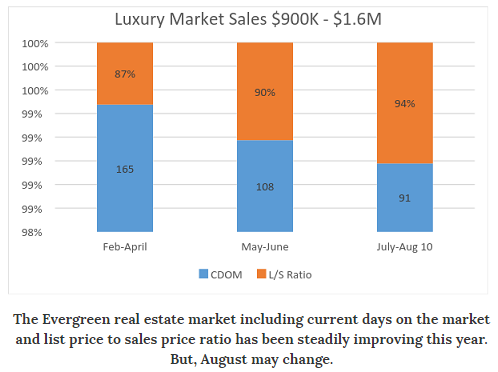 Still, if you are a buyer for an Evergreen Colorado luxury home priced between $900,000 - $1.6m, these statistics will help you and your agent take advantage of timing that is so critical in this market. First let me say, that in this price range, 6-9 months of inventory has been normal in previous years. But that old statistics have been challenged in 2016. The market is clearly improving. Click here for current listings in Evergreen. 2016 has been a climbing real roller coaster in the Evergreen market. It's all been improving even with more and more homes coming onto the market every month. Good sales have kept prices up and the number of current days on the market low. From February 1st to April 30th, 2016, there was a huge 2 year inventory of homes for sale. Realtors call that the Absorption Rate. That means that if no new homes came onto the market and the sales rate continued at only 2 homes sold per month, it would take 3 years to fully absorb the current inventory. Only 6 homes were sold in that 3 month period that were priced between $900,000 and $1.6m. These buyers received an average of 13% discount off asking prices while the average actual sold price was $1.05 m. Of course, these homes had been sitting on the market for 5 Â½ months on the average. 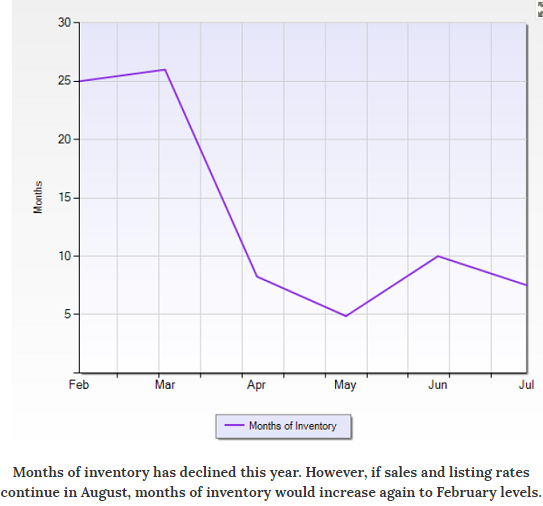 From May 1st to June 30th, inventory of Evergreen homes for sale dropped to 5-7 months of inventory. 11 homes sold in that 3 month period. The Average Sold price rose to $1.123m while Buyers paid an average of 90% of asking prices. Average days on market declined to 3.6 months. 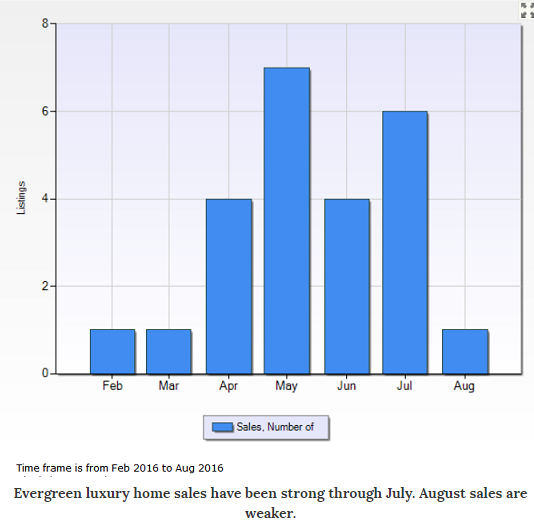 As you can see, our Evergreen real estate market has been slowly but substantially improving But, where are we now? If you were a buyer in this market today how much leverage would you have with listed prices? From July 1st to August 10th, , 15 homes sold or are under contract at an average price of $1.125m. The List to Sell ratio has increased again to 94%. 47 homes are currently listed. The average days on the market for those homes is 150. We we now have nearly 16 months of inventory on the market. That's quite a change in less than a month and that suggests buyers should have some more leverage with Sellers in the months ahead. I think there are 2 different lessons in this data. Clearly, the first is that Buyers should get into the market now while they have leverage over prices. The second lesson is that Sellers need to price appropriately in the last quarter of 2016. Sellers, please listen to the price your Realtor suggests. This is no time to hoping for blue sky prices. We could be in a bit of pullback or at least a "high plateau" of homes prices.